As a writer, I am often reading books with an eye to what catches my interest and keeps me reading. 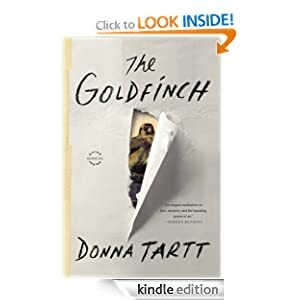 My biggest fear is that my writing will bore people, and that is one thing Donna Tartt shouldn’t worry too much about, as her latest novel, The Goldfinch, grabbed my attention and held it tightly for much of the hefty (755-page) book. The Goldfinch claims as its center the diminutive painting of the same name by Dutch Old Master Carel Fabritius (pupil of Rembrandt and teacher of Vermeer.) In modern-day New York, thirteen-year-old Theo Decker sees The Goldfinch at the Metropolitan Museum with his mother. Shortly thereafter, tragedy strikes, his mother dies, and the painting haunts Theo for the next fourteen years of his life. This ambitious novel, which was named an Amazon book of the year, explores ideas of art and love, originals and fakes, fate and coincidence. Though it is too heavy-handed at times to be called a true masterpiece, The Goldfinch showcases Tartt’s mastery of storytelling and makes for one hell of a good read. There is a lot a writer can learn from The Goldfinch: how to take risks, how to keep a quick pace, how to create an unreliable narrator. The story is told by an adult Theo who reveals at the very beginning that his mother died, it was all his fault, and that things would have turned out better if she’d lived. After this opening, Tartt takes her sweet time getting around to the actual tragedy – an early hook (and one of many) that kept me flipping pages. Tartt manages to take her time throughout the sweeping story, and yet she infuses the narrative with a sense of urgency as well. Some of the urgency comes from the Goldfinch painting. For innocent and confused reasons, Theo steals it from the museum on the day of his mother’s death. He tells no one and keeps it wrapped in a pillowcase underneath his bed. He carries this secret with him – both literally and figuratively – as he moves from the home of a wealthy New York school friend to his alcoholic father’s house in Las Vegas, and then, finally, to live with Hobie, a kind older man and his redheaded ward, Pippa, with whom Theo is hopelessly in love. The story picks up steam in Vegas, where Theo becomes best friends with Boris, an Eastern European delinquent/genius with a larger-than-life personality, and here another thread of urgency begins to spool as the two experiment heavily with alcohol, drugs and petty crime. The sleazy world in which Theo suddenly finds himself comes alive in a very visceral way, and, like the desert that is encroaching on his half-abandoned Vegas neighborhood, there is an eerie sense of impending doom that is heightened with every shot of vodka, every hit of acid. The scenes in which Theo and Boris get drunk, puking in the pool or blacking out on Theo’s bed, were so affecting I often found myself pressing my hand to my stomach, feeling physically ill myself. Halfway through the book, time skips ahead, and we find Theo back in New York, in his early twenties, working as an antiques dealer. He is addicted to prescription painkillers and selling pieces of knockoff furniture as originals for huge sums of money. Boris reappears, and, like an ultra-marathon runner, the novel starts on the second leg of its long journey. The plot moves with increasing tension, but as the story nears the finish line, it begins to break down. There is a confused series of events in Amsterdam with a string of gangster-type characters and an eventual shootout, all of which seem both tedious and unnecessary. If only the book had gone for less of an action-movie climax, I might be singing a different tune. Instead I have to conclude that even though there is much to admire in The Goldfinch,there are imperfections as well. Some of the characters teeter on the edge of stereotypical, and whether Tartt meant to or not, the book is rife with bad fathers, to an almost absurd degree. Theo’s father, Boris’s father, Hobie’s father – all are so horrible they start to seem fake. And then there is Theo himself. His downward spiral makes for a great story, but his character is frustrating, sickening, and, at time, hard to believe. At the very end, when he makes a series of grand statements about what he has learned about life – “that fate is cruel but maybe not random…it is a glory and privilege to love what Death doesn’t touch,” it all seems a little suspicious, like the author adding a quick coat of varnish, trying to trick us with her sheen into thinking the book is something greater than it is. But, like an expertly-crafted fake, these imperfections are slight, perhaps only visible under scrutiny, and with a step back, the overall effect of the novel is impressive. The descriptions are rich and affecting, the language elegant. (Although one does wonder how Theo, a boy who drank away his adolescence acquired such a cultured voice.) Still, the book is engrossing. Tartt takes huge risks – with her characters, her settings, her situations – and even when they don’t quite work they are never boring. Perhaps this is why Theo’s musings on life don’t ring true at the end – because his story is larger than life. It is a bildungsroman on steroids. It’s the buff excess that makes it so much fun to read. A masterpiece is one of those rare works that stands the test of time: a painting you can stare at for hours, a book you can read over and over. It is a work that reveals new and different nuances every time you revisit it. And so The Goldfinch is not a masterpiece. In time, I imagine, it will fade and be forgotten. And yet. And yet. There is a place for it. This was a book I was happy to get lost inside; a story that entertained me on the very highest level. It was a wild ride with a master storyteller at the wheel, and I feel like I learned a lot about how to write so people will keep reading. Want to score a manuscript consultation with Dinty W. Moore, Shelley Puhak, Jen Violi, or Tawni Waters – AND help Burlesque Press out at the same time? Or wanted to go to The Hands On Literary Festival and Masquerade Ball but haven’t got your tickets yet? Get them through our GoFundMe campaign!